We believe in keeping our environment beautiful, and our impact sustainable. 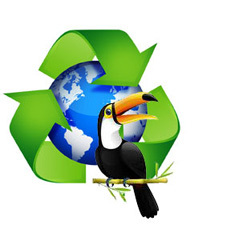 At Green Jungle, Inc., we see responsible recycling as a duty, not an option. Since the day Green jungle was established, we have taken the time to recycle or re-use all our green waste, all packaging and shipping materials. • Recycling and composting all green waste. Green Jungle, Inc. recycles over 100 tons of green back to Mother Earth. • Recycling packaging and materials. Green Jungle, Inc. recycles over 5000 lbs of plastic and 2000 lbs of paper. • We use products and methods that will keep your plants healthy, shiny and pest-free at no cost to the environment, and no extra cost to you. • When using products we choose organic, natural and biological applications with extremely low toxicity rates. Plants in the workplace offer more than aesthetic value. In fact, studies have shown they help reduce stress, enhance employee attitudes, increase productivity, and improve air quality.Extensive research by NASA and other organizations documents the ability of interior plants to clean indoor air of toxic contaminants. Plants also help to improve humidity and reduce dust and other airborne microbe levels in today's energy efficient buildings. We conduct a complete site analysis of lightning,environment and plants; identifying areas that can be improved or deliver solutions to any existing problems. Our Interior Plant is thorough. We guarantee that we will be able to enhance your plants and more importantly save you money. Proper watering techniques are the single most important factor in the vitality and longevity of indoor plants. Watering requirements are seldom routinely predictable. Techniques are influenced by environmental conditions such as light, temperature, humidity levels and soil content. Most plants need watering every 7 - 10 days, however, some varieties should be allowed to dry out between watering. With these factors in mind, our service technician may water each plant differently with each visit, guaranteeing proper plant management. Plant foliage is made up of cells, including pores, which act as filters. Dust can collect on the foliage as well as it collects on your furnishings, to the point of clogging the pores that exchange oxygen and carbon dioxide. Cleaning and polishing the foliage is necessary in maintaining a healthy, natural shine on the foliage. Most plant polishes only act as a magnet to attract more dust. Our service technician will clean the foliage on a regular basis, applying the best possible finish without damage to the plant in order to maintain a fresh, healthy appearance. Areas where air ventilation and/or floor level foliage is installed as part of architectural mandates may be requisite to extremes in maintenance levels and will be subject to additional cleaning labor costs. All plants are in a constant process of growing and dying. As the new, healthy growth takes hold, older foliage generally starts to shed or in some instances, show up as leaf burn at the tips of the leaves. Early in the leaf burn stages it is usually unnecessary to remove the entire leaf. At this point, our service technician may trim the older foliage slightly, while maintaining the natural shape of the leaf. Fertilization can promote various aspects of healthy plants and provide them with essential nutrients. Most plants are designated for specific areas by size, so rapid plant growth is not the main objective for fertilizing interior plants. Our fertilizer is formulated to provide proper nutrients designated for maintaining strong cell development and healthy foliage. Our service technician will routinely add fertilizer solution to the watering on a 4 - 6 week schedule. Pruning of tree type plants is essential for promoting new growth. As older leaves are shed, our service technician will prune out the unproductive areas, stimulating the roots to produce healthy, new growth. All plants grow symmetrically when left to their own production and have a wonderful way of filling in, allowing their foliage to get a maximum of light. Pruning may be necessary to prevent overgrowth in some varieties. Our service technician will determine when pruning is appropriate. All plants have the potential to develop pest or disease related problems. Our service technicians are trained to spot any suspect conditions at an early stage where treatment is most effective. If any treatment is necessary on location, mists or sprays used are safe for public areas, although you may notice a slight odor. If plants do not respond to treatment, they will be removed and replaced promptly. If plants have been relocated within your facility, especially if they have been moved to a secured area, please inform our service technician immediately and provide access to the plant promptly. Interruption of our maintenance service for the plant could result in deterioration and have jeopardized the guarantee of the health of the plant.